Serial entrepreneur Jenny Q. Ta is in a rush. Her destination? Another million-dollar idea. Speed is her friend, and it's served her well so far. "As a kid growing up on welfare in Fresno [Calif.], I learned early on that I had to make things happen for myself," said Ta, 44. Ta graduated a year early from high school and got a degree in business information systems from California State University in just three years. At 21, she got an entry-level job at Lehman Brothers for $10 an hour as a new accounts clerk. "It was one position up from a filing clerk," she said. She quickly mastered jobs in the brokerage bullpen, but quit in a year. "I was told that as a woman it would take me years to advance and become a broker," said Ta. Ta spent the next few years working as an independent broker. Then the entrepreneurial bug bit. She decided to open her own firm, and called all the brokers she had befriended, promising to pay them more than they were currently making. It worked. Ta launched Vantage Investments in 1998 with 30 brokers. She was 27. "I became a millionaire," she said, adding that it happened in less than a year. 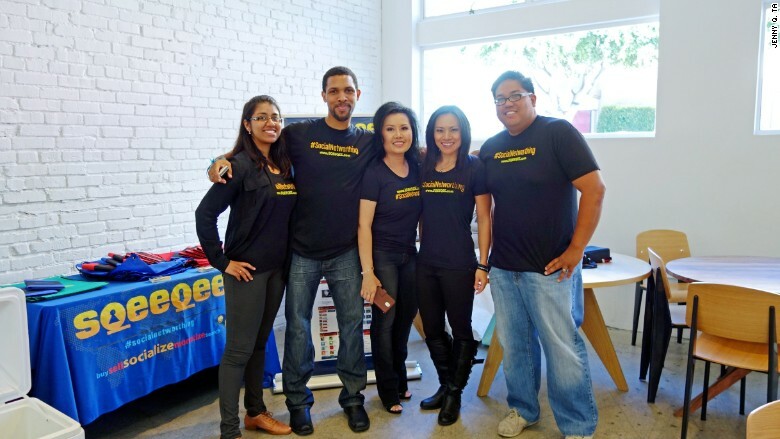 Jenny Q. Ta (center) with the Sqeeqee team. Risk-taking is inherent in Ta's early success. It's a trait she inherited from her mother, who fled Vietnam in 1977 and brought Ta and her brother to Hong Kong. Two years later, when Ta was 9, the family came to the United States. Fitting in was hard. "I didn't speak English and was made fun of in school. I got beaten up a couple of times," she said. "Looking back, I ask why I wasn't as strong then as I am now." But her confidence grew when Ta realized she excelled in math. "Power and wealth come from education. I wanted to succeed as quickly as possible," she said. While her friends went bowling and dancing, she buried herself in schoolbooks. "I did this 99% of the time," she said. Ta sold Vantage in 2001 for an undisclosed amount after growing it to $250 million in assets. She subsequently got her MBA at Fresno State University and launched another brokerage firm, Titan Securities, in 2005. Remarkably, she was approached by a buyer for Titan that same year. "I was flabbergasted. I hadn't even built up assets yet," she said. "The buyer liked that it was new enough to not have much exposure and not old enough to have skeletons in the closet." Ta stayed on as vice president, although she had the itch to do something else. So after 20 years on Wall Street, in January, Ta launched her third startup: Sqeeqee. Funded with $5 million -- $1.2 million of her own money and the rest from family and friends -- Sqeeqee lets users monetize and generate ad revenue from their social media activities. "Our platform lets you make money doing what you're doing online, like posting status updates, sharing pictures, hosting videos," she said. Ta said Sqeeqee's registered users jumped from 25,000 a few days after it launched to hundreds of thousands today. Tucked away at the back of her head is yet another idea: "It's hardware related. I'd love to talk to Tim Cook about it," she said. "I believe in my ideas," she added. "If you feel strongly about yours, sometimes you just have to close your eyes and go with it. Don't think too much."